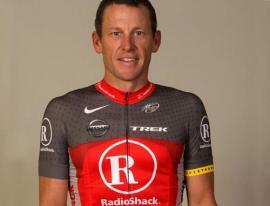 Armstrong has “feel good” feeling for Tour Down Under. That’s good. Three words anyone who hopes to beat Lance Armstrong hates to hear. “I feel good,” said the seven time Tour de France winner. Yup, Armstrong arrived in Adelaide for Sunday’s Tour Down Under feeling like a spry 38 year old. Maybe a little jet lagged but nothing that a four hour training ride, some one arm pushups and a protein shake won’t cure. “I mean I’m a little tired now because it’s a long day, but physically, a little better than last year,” said the Texan. Lance isn’t out to win the six stage Australian race that begins May 19. It’s just an outback training exercise except for Radio Shack teammate Gert Steegmans, who’s aiming for a stage win. But there’s no question Lance’s condition is better than last year at this time. There is much joy in “The Shack” and much concern on the frozen steppes of Astana. “The indications we had in training, based on being on the same roads I was on just before the Tour Down Under last year, the condition is better, but we’ll see how the race unfolds – there’s other guys who are big, big favorites here,” he said. Veteran Armstrong insiders know he has only three levels of fitness: Feel Good, the early season level, Feel Really Good, which happens in June and towards the Dauphine Libere and then, heading into the week before the tour, the final level – in this case, Feel Good Enough To Destroy Skinny Spaniard. “Feel good” is just another indication that Armstrong is committed and on track for an attempt at an eighth Tour De France victory in July. Sure, Alberto Contador and Andy Shleck probably feel pretty good, too. But they’re not almost 40 years old and the parent of four kids. Saddle them with poop-crusted diapers and a demanding, sleep deprived wife and the tables turn in Lance’s favor. Twisted Spoke knows “feel good” is a particular code phrase of all aging athletes. In Armstrong’s case. Feel Good means you’re feeling awesome. « Valverde’s dog to testify before Court of Arbitration in Sport.